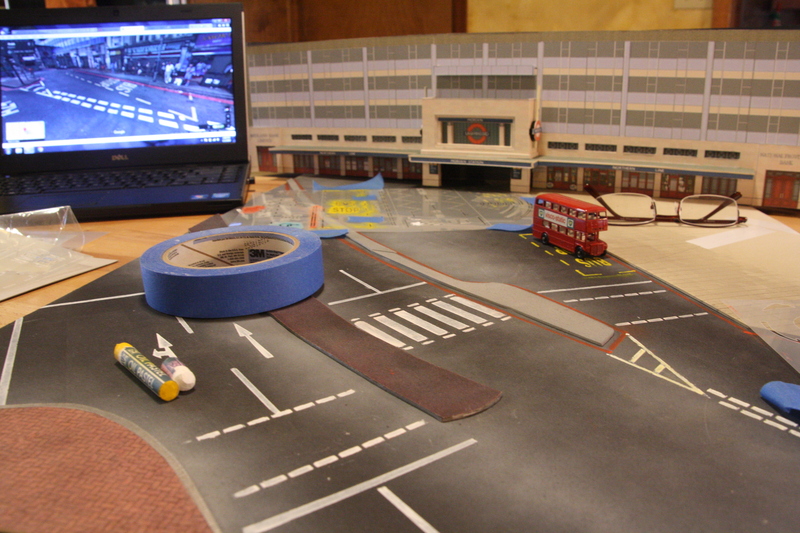 The year has started off well with some good progress on my London Underground scene. I’m calling it Morden Diorama and using it as a proving ground for the upcoming exhibition layout based on the London Underground. More on the layout later in the year as progress develops. 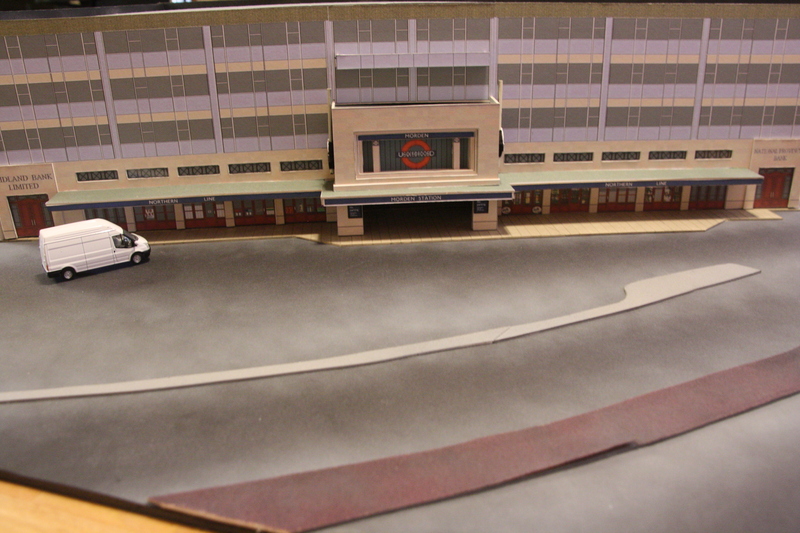 I’ve chosen to model the London tube station “Morden”, which is at the end of the Northern Line. 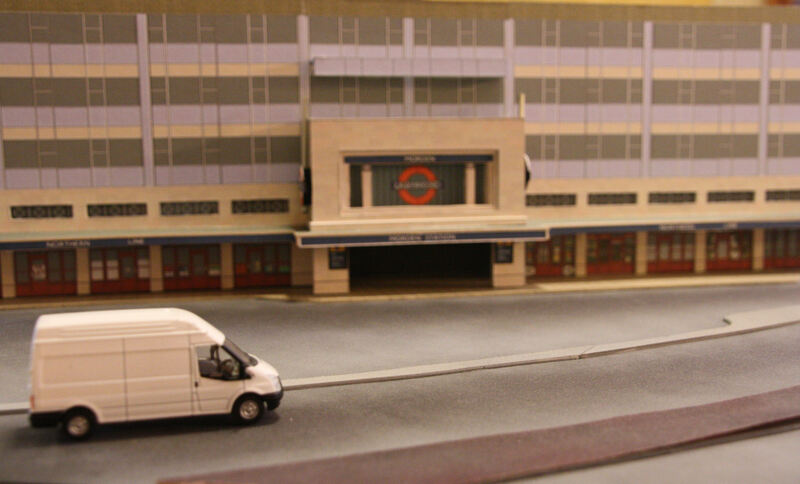 I purchased a cardstock kit of Morden station from Kingsway Models in UK – a firm that specializes in cardstock models and London Transport. 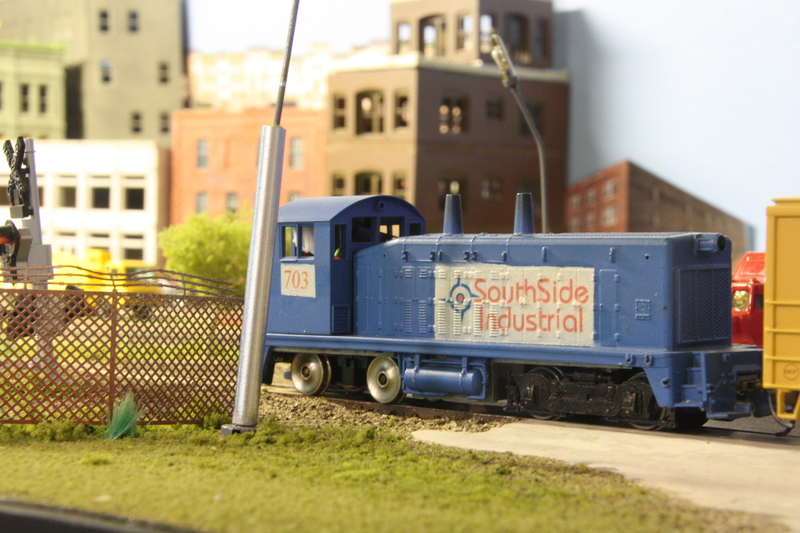 The kits are OO scale which is 1/76 ratio, but uses the same track gauge as HO. The kit comes with the pieces pre-printed on cardstock. I spent most of 2015 assembling the building – lots of cutting and gluing. Most of the model is finished, however I’ve got some details to add to get it to a higher level of completion. I placed the building on a foundation of 0.06 styrene atop a standard sheet of black foam core purchased from a big box store. Using Google Maps, I determined the placement of sidewalks, medians, and pavement of the surrounding area. Again, I modeled all of these with 0.06 styrene. Some were painted with grey primer, while others were covered with texture sheets including a herringbone pattern for one of the walks. Next came the road markings. I deliberated long about the method to use to create them. The straight lines would be simple enough to mask off, but other markings, especially text on the road, would be more complicated. I knew free hand would not yield clean and crisp results, and cutting a template from printed text would be just as difficult. 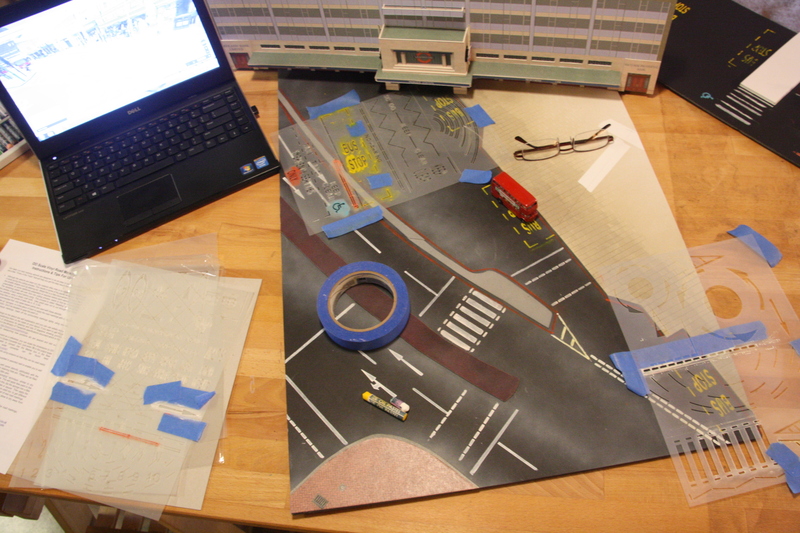 I settled on some vinyl sheets of road markings from the UK manufacturer Scale Model Scenery. They were the perfect solution. After watching my wife apply various media to black foam core, I settled on oil pastels. You can color over the template like crayons and then rub them in with your finger to fill in all the nooks and crannies. I works surprisingly well. With the ability to zoom in on Street View of Google maps to get correct placement, you can get a pretty convincing final effect. That’s how far I have made it to date. 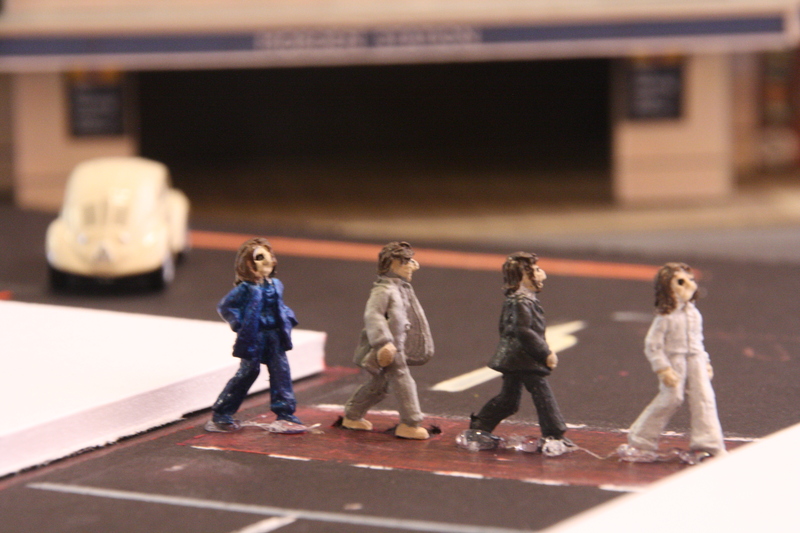 Still to do are the hardware – railings, guardrails, lights; figures; and vehicles and some minor details. Then as a stage 2, I plan to model two levels below ground somewhat like the urban sculptor Alan Wolfson. 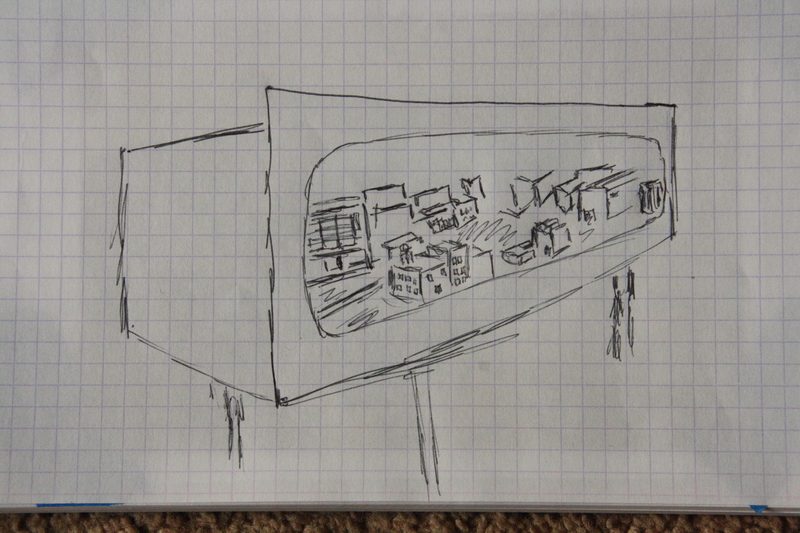 Though not prototypical, I’ll model the station platforms and passenger cars (carriages) under ground. So far, doing the research and modeling has been a fun project and should give me some good experience for the upcoming London Underground exhibition layout. Check back for progress updates.